2. Weird Words: Standing pie. 4. 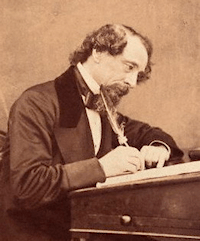 Articles: The Words of Dickens. Macmillan competition We came third. The English Club was second. The winner was Wordsmith, the home of Anu Garg’s A Word A Day, which came romping up from behind at the last minute. But then his daily e-mail newsletter has rather more than a million subscribers, which makes World Wide Words’s 50,000 readers look paltry. I’m delighted he has won: he deserves to. Many thanks go to everybody who supported World Wide Words. And a special welcome to all who have subscribed through learning about us via the competition. Words of 2011 The results were announced on Wednesday of the Macquarie Dictionary’s Australian Word of the Year awards for 2011. It’s the most complex of all the public contests, with votes requested for lists of words in 16 different categories. The Word of the Year is selected from among the category winners by the Word of the Year Committee, which is chaired by the Vice-Chancellor of the University of Sydney, Dr Michael Spence. Another winner, The People’s Choice Award, derives from the voting on the website. This year, the word is fracking, in the news in the US and UK as well as Australia. It’s a shortening of fracturing and is the process by which gas and oil are extracted from shales underground by applying chemically treated water under pressure. It’s mostly linked in the public mind with stories of groundwater contamination and earth shocks. A report by Jonathan Fahey of the Associated Press on 26 January said that the industry prefers frac and fraccing and argues that the k was added by opponents to make it more like the F-word and to suggest the violent connotations of words such as smack and whack. Three of the winners of individual categories drew the attention of the committee. A patchwork economy refers to a country in which some parts are doing well while others are less prosperous. As a phrase, it has been common in several countries for many years, but became part of the Australian political vocabulary in April 2011 when it was used by the prime minister, Julia Gillard. The Macquarie Dictionary’s publisher, Sue Butler, commented in the Sydney Morning Herald on 31 December that the phrase is “more homely and domestic” than others such as “two-speed economy”. Dairyness, from the Agriculture category, was a strange choice. It refers, the Macquarie Dictionary says, to the productivity of a cow in terms of the quality and quantity of its milk, assessed by udder shape and size, pedigree, genomic screening and other factors, which are used as judging criteria in competitions. As a specialist term it has been recorded in North America since the 1950s but a search of the newspaper archives of Australia that I have access to found no trace of it. Next Tuesday, 7 February, is the 200th anniversary of the birth of Charles Dickens. It has been impossible to avoid knowing about this impending event for several months because of way that the British media has anticipated it, with its usual concern to get ahead of its competitors. Boredom has set in for many British readers and viewers, few of whom these days read him. I was going to pass over it in silence, not wanting particularly to add to the hoopla. But then, in an idle moment of curiosity, I fired up the Oxford English Dictionary to learn more about the linguistic legacy the man has left us. He wrote such delightful and insightful descriptions of London and its people that I wondered if his verbal inventiveness matched his artistic abilities. Dickens is highly rated by the OED. He is the 13th most frequently quoted source, well ahead of his contemporaries, though this may in part reflect his extraordinary output rather than his creativity. Among the 9,218 quotations from his works in the OED, 265 words and compounds are cited as having been first used by him in print and another 1,586 as having been used in a new sense. Life’s too short to look at them all; let’s concentrate on the 265 new words and phrases. He’s credited with inventing such standard English terms as boredom, flummox, rampage, butter-fingers, tousled, sawbones, confusingly, casualty ward, allotment garden, kibosh, footlights, dustbin, fingerless, fairy story, messiness, natural-looking, squashed, spectacularly and tintack. Anybody who cites these based on the OED’s evidence risks being regarded as out of touch. Most of the entries haven’t been revised since they were compiled a century ago. Our etymological knowledge has improved greatly since then and has had a huge boost from the introduction of searchable digitised archives. I trawled the British Library’s archive of nineteenth-century newspapers to check how original these words really were. A lot weren’t. Boredom, for example, which Dickens included in Bleak House in 1853, is known from the Theatrical Examiner of April 1841; he used casualty ward in Sketches by Boz in 1836 but it’s known from Jackson’s Oxford Journal dated January 1825; footlights is in the same work but is earlier in the Morning Chronicle of December 1822; natural-looking is likewise from Sketches by Boz but a Mr T Hood advertised natural-looking wigs in the Morning Post a quarter of a century earlier, in November 1810; confusingly, from a letter of May 1863, is in the Morning Post of February 1852; sharp practice comes from The Pickwick Papers of 1837 but is trumped by The Bury and Norwich Post of February 1810; fairy story, which Dickens included in David Copperfield as an alternative to the older fairy-tale, may be found in the London Standard in December 1827; snobbish, in The Old Curiosity Shop of 1841, appears likewise in the London Standard, in May 1836; kibosh, also from The Pickwick Papers, has been backdated several years by recent careful research. Other terms are certainly his to claim, including butter-fingers, unpromisingly, sawbones, messiness, spiflication, whizz-bang and seediness. Flummox appears in The Pickwick Papers of 1837 but was also included by James Halliwell-Phillipps in his Dictionary of Archaic and Provincial Words in 1846 — it seems that Dickens breathed new life into an old dialect word. 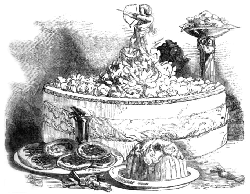 Tousled, as touzled, is in Dombey & Son of 1848, but appeared four years before in the Manchester Times and Gazette of December 1844; however, this is in a story with the title Trotty Veck and the Nor’-Wester, by one Charles Dickens, so he has neatly antedated himself. None of this detracts from Dickens’s skill in using language. He is the first recorder of many items of slang (one contemporary critic called him the professor of slang), which he didn’t invent but which his sharp ear for colloquial speech lovingly noted. In other cases he popularised colloquial terms that might without him have died out, such as kibosh and devil-may-care. He had a trick of making compound adjectives from existing words that concisely expressed a thought: angry-eyed, hunger-worn, proud-stomached, fancy-dressed, coffee-imbibing and ginger-beery, as well as new compound nouns such as copying-clerk and crossing-sweeper. As these examples show, we must always be sceptical of claims about who invented a word. Deeper digging often demonstrates that others had got to them first. But nobody is going to be less attracted by Dickens through knowing that. • The San Francisco Chronicle’s website had a headline on 31 January (sent in by Jim Tang from Hawaii): “Ranger zaps off-leash dog walker with shock weapon”. I’ve long suspected that it’s the owner who’s on the leash, not the dog. • An Associated Press story dated 31 January was spotted by Richard Collins on the website of the Wisconsin State Journal: “Woman killed in car accident facing prison time”. That was, of course, before she was killed. Last modified: 4 February 2012.